Songs I Like by Artists I Don’t–“Renegade” Styx. I have a pretty strong disliking for Styx. Styx Stinx. I do find Come Sail Away to be funny although I don’t think the band intended it to be and because I have been a life long fan of the Pittsburgh Steelers I will give it a thumbs up. They will play Renegade as Heinz Field for the Steelers defense before an important drive. 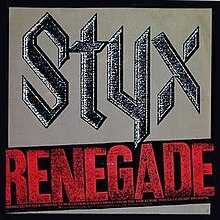 Renegade was a single from Styx’s Pieces Of Eight album and as a single reached #16 in the spring of 1979. The song was written by band member Tommy Shaw. Renegade I am told is usually the final song Styx plays during their concerts. There are a few other good Styx songs. Babe is not one of them. Hmm…I like Styx. I especially like “Come Sail Away”. Yes, it’s cheesy, schmaltzy and over produced but it’s a 70s Rock anthem. It paved the way for equally cheesy, schmaltzy Rock anthems of the 80s like “Don’t Stop Believing” and “Every Rose Has it’s Thorn”…And I think that’s a good thing. Don’t get me wrong–it’s tragedy that Rock as a whole became cheesy, schmaltzy and over produced until Nirvana blew the whole thing up–but that’s not Styx’s fault. To me Styx is a harder, geekier version of The Raspberries and Tommy James and the Shondells. I thinks that’s a good thing too…”Renegade” rocks. Ok. Let’s try that, again (stupid phone). It’s the first song of their’s that caught my attention.